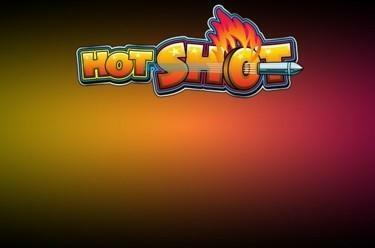 Play Hot Shot online for free now! In Hot Shot you can either play on the lower or upper reel set. Once you have arrived at the top game there is a good chance of you scoring a Hot Shot which comes with plenty of Twists. Your aim with Hot Shot is to land 3 identical symbols along one of the win lines (1 in the basic game, 5 in the top game). The order of the symbols has to be from left to right. Payouts are made from at least 2 winning symbols. The Wild symbol (Wild Star) is only available in the top game and substitutes for any other symbol except for the Hot-Shot-Symbols. The Crown symbol pays a Mystery Win in the basic game. or transfer them to the Supermeter. If you opt for the Supermeter you win is transferred there. If you have reached a certain amount of coins in the Supermeter you can switch to Supermeter mode. During the basic game the Hold-Feature is activated (not during the top game). After every spin you can hold up to 2 reels. All you have to do is click on the red buttons below the respective reel. If you decide to lock one or several reels they are fixed until your next spin. A spin where the Hold-Feature is applied costs 1x your stake. The computer supports you and holds the most promising reels for good symbol combos. You can release the automatically fixed reels at any time. For 3 yellow Hot-Shot-Symbols you win a shot at the yellow paytable. For orange Hot-Shot-Symbols you win a shot at the yellow and orange paytable. For red Hot-Shot-Symbols you earn a shot at each paytable. When you have won a shot (Hot Shot) the winning symbols in the yellow table start to flash randomly. Now you have to click the "Stop" button and the shot is fired. Should you win several shots, first the symbols of the yellow paytable start flashing followed by the orange and red paytable. Your winnings are automatically transferred to your Supermeter. While you are playing in top game mode you can transfer your current meter score to your credit at any time. 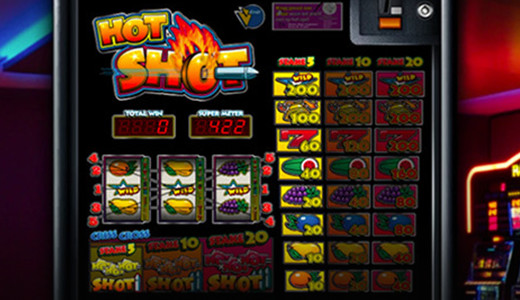 Sharp shots and sizzling winnings – welcome to Hot Shot. In this action packed slot you come to know how to rake in Twists big time and how to fire a nice shot. Have you got a steady hand? Then you will shoot down huge winnings! Do you want to pay a visit to the shooting range first or have you already got what it takes to embark on this adventure?